I knew that Lisa Deutsch Harrigan, riding Amtrak back from Westercon 71 in Denver, would be going by the house this morning, and from checking the Amtrak "track a train" page this morning knew about what time I could expect her to pass. Initially I didn't think I'd be able to go out and wave due to back-to-back-to-back meetings scheduled today. However, the third meeting was canceled, and as the second one ended, I turned up the radio scanner and heard the engineer of westbound #5 talking to a track maintainer. She read back the maintainer's orders permitting her to bring her train through Fernley at reduced speed due to track work. That told me that the train was nearly here, so I got my camera phone out, determined to take pictures and video this time. Here's the video of the train going by. 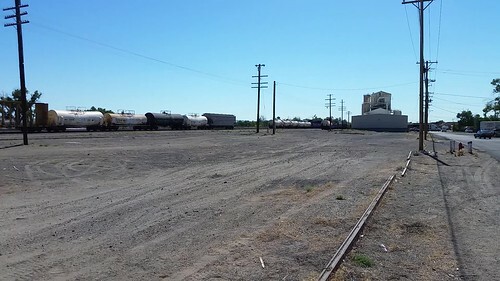 Alas, unlike the eastbound trip, Fernley's small yard was full of cars today, spoiling the view. 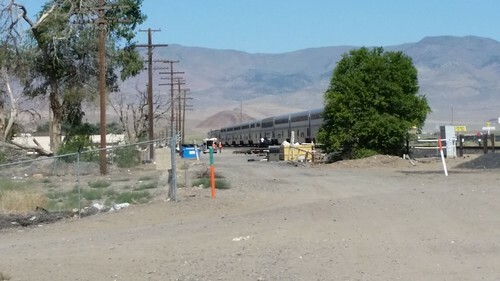 Normally the California Zephyr scoots through at full speed (79 mph), but on top of there being a maintenance-related speed restriction, the train was also about to make an unscheduled stop. If you watched the video above, you may have noticed that the door on the next-to-last car was open, and a conductor was standing in the doorway with a step box. The train slowed to a stop with the open door across from the maintenance yard. I cautiously moved a little closer so I could see what was happening, and saw that an ambulance (I later learned over the scanner that it was North Lyon County Rescue 61) was alongside the train. From my vantage point, I saw the people help someone out of the train and get them into the ambulance. Shortly after helping the person from the train to the ambulance, the conductor climbed back aboard and I trotted back to the house, where I could hear both the train and ambulance communication. The ambulance headed for Northern Nevada Medical Center, while the conductor gave the train a "highball," whereupon the engineer gave the requisite two toots of the horn and set off for Reno. Lisa, on board the train, caught this picture of me shooting pictures of the train. That's Fernley House shrouded by summer tree growth across the street behind me.